HashGenerator is the universal hash generator tool which automates the generation of 14 different type of hashes or checksums. It support most of the popular hashes including MD5 family, SHA family, BASE64, CRC32, ROT13, RIPEMD, ALDER32, HAVAL, WHIRLPOOL etc. It can even generate hash for the file as well as text input also. User can directly enter or paste any text from clipboard and generate hash. It also supports ‘Drag & Drop interface’ which allows you to quickly drag files onto the tool for hash generation. 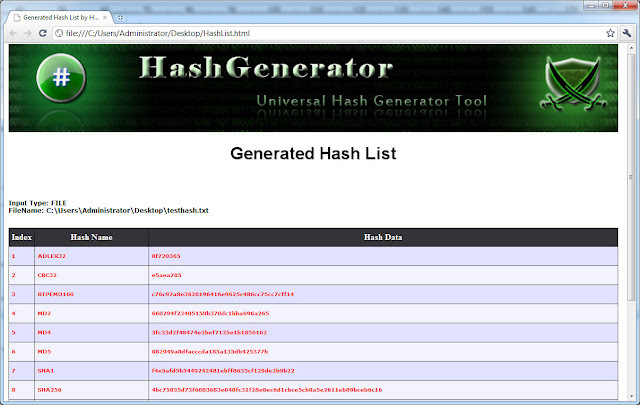 HashGenerator is fully portable tool which can be directly run anywhere without installing locally. It also comes with Installer for those who wants to install it locally and use it on regular basis. - Generate hashes for 14 popular algorithms including MD5, SHA256, BASE64. -’Drag & Drop’ feature to quickly drag files onto the tool. - Right click option to selectively copy the hash from the displayed list. - Simple, Easy to Use GUI Interface. - Completely Portable Tool which also comes with Installer for local Installation & Uninstallation.